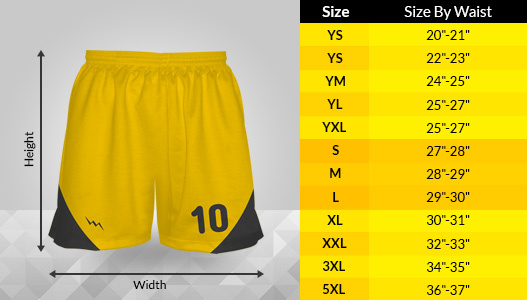 Below is a sizing chart for adult and youth sublimated girls shorts. The size chart relates by waist measurement. Smaller and larger sizes are available upon request. Please feel free to call us at 888-GET-STRK with any sizing questions or concerns. The womens lacrosse shorts have an elastic waistband and can be purchased pockets. If you are unsure about the size, please call us to discuss. Girls shorts can be ordered in any color, design or pattern. You can add unlimited colored logos, names and numbers. If you are unsure about our sizing, please call us at 888-438-7875 and we can help you. Sizing for sublimated lacrosse shooter shirts and hooded sweatshirts will be posted soon. For sublimated reversible jerseys use the charts above for proper sizing.